Why do Test Stands Need Higher Accuracy Pressure Sensors? In the test and measurement industry, manufacturers need to test the products they build. Pressure sensors are needed in test stands to measure pressure across various mediums, including air, fuel, coolant, gas. Testing can be expensive and having a reliable sensor eliminates costly downtime. 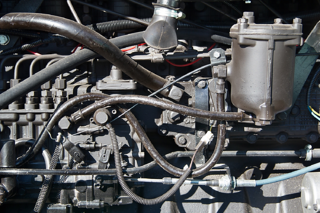 The drive for greater fuel efficiency commands a more accurate pressure transducer. Government regulations demanding change in both on and off highway vehicles emissions and fuel efficiency require test stands with higher accuracy pressure transducers to meet those standards (i.e. Tier 4 guidelines for construction vehicles). How can the AccuSense products help your test stands? Test stands will use multiple pressure sensors to measure pressure for different mediums, at different pressure ranges. Because of the long term stability, the AccuSense products tend to last longer than competitors and need to be replaced less. The Secure-Calibration accessory removes trim pots enabling better long term stability. This product secures the calibration from unintended operator adjustments. It also allows for restoring factory calibration adjustments in case of an inadvertent span adjustment. This keeps the test stands up and running longer, reducing downtime and saving calibration/technician costs. Some of our customers put up to 100 sensors on a single test stand. At that volume, our customers certainly want the most reliable and accurate pressure sensors with short lead times! CLICK HERE to learn about engine test stands.